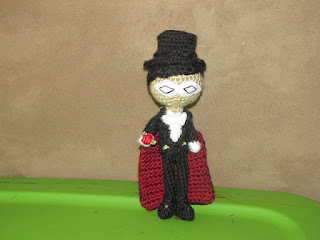 well, here's Tuxedo Mask. he's not my favorite. I've noticed that any project that inolves switching colors like this partway around the round never seem to turn out well for me. Apparently I just haven't mastered it. it's not terrible, but I just have some issues. He was based on the Prince Eric pattern- I do have a Prince Eric pattern, I just haven't made a Prince Eric yet. I added a cuff through the front loops around his ankles and the bottom of his jacket to create definition, and then again on the edges of the white to create the lapels of his jacket. 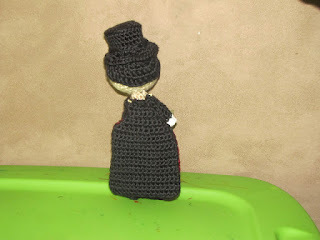 he does have a little bowtie, although you can't really see it. I just tied some yarn in a little bow and stitched it on. His mask is cut out of felt, which I normally feel is cheating, but I could not think of a better way to do it. I modified a mini top hat pattern so that it would fit, and added a rose, naturally. My biggest issue is the cape, I used the pattern for Snow White's cape, just made it longer, and I do not like the shape. But it's probably not enough to redo it. 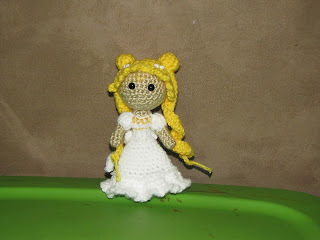 and here's Princess Serenity. I wasn't planning on making her, but the tumblr blog I'd been submitting these to (just to show off) begged me to make her. And I'm glad I did, she's super adorable. used Snow White's pattern for the dress, since she had puffy sleeves. I added a row to the bottom of the skirt, and her arms. On the third row from the bottom I did it through the back loops to create a line around the skirt, since Serenity's skirt is kinda two layered. I did a ch-3, sl st in next st ruffle all around the bottom of the skirt. 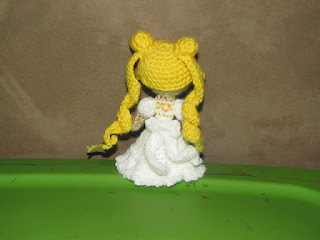 Added a bow to the back, using the same method I did for the Senshi, and embroidered the details. And she's got Tinkerbell's legs, with white shoes, just like I did for all the other Princesses. So I've got one set of eyes left and I'm wondering what to do with them. not sure yet. Big News! I suppose. I made an Etsy shop.